Professor David Spector and postdoc Sonam Bhatia with members of the MWCABC Research Committee. 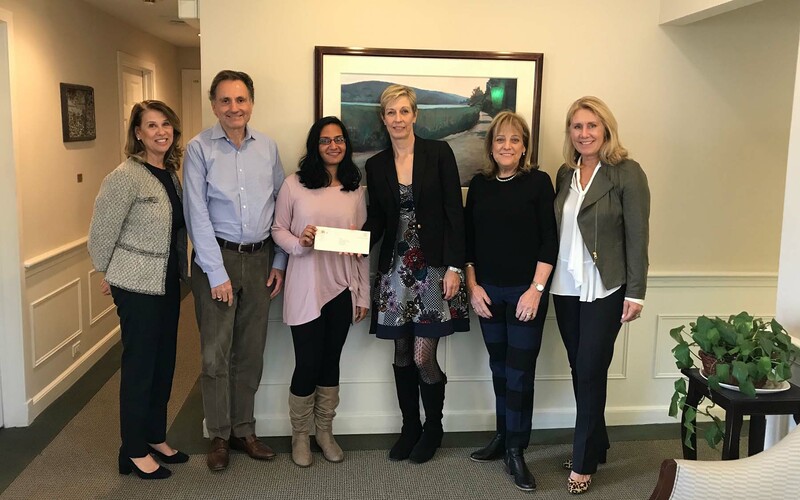 Manhasset Women’s Coalition Against Breast Cancer (MWCABC) has donated $100,000 to support breast cancer research at Cold Spring Harbor Laboratory. The donation supports the research of postdoctoral fellow Dr. Sonam Bhatia whose work focuses on developing new therapeutic targets for breast cancer using organoid technology. Members of the MWCABC’s Research Committee recently visited the Laboratory to present a check to Sonam and her mentor Dr. David Spector. In total, the organization has donated over $575,000 to breast cancer research at Cold Spring Harbor Laboratory. MWCABC’s mission is to fund innovative research, increase awareness through education and provide support services to those with breast cancer and related diseases. MWCABC participates in various fundraisers throughout the year and hosts several signature events, including Ladies’ Night Out, 5K Family Walk/Run and “Mix & Mingle” couples event. Through these and other MWCABC events, the group has successfully awarded almost $4 million in grants to breast cancer programs and organizations. MWCABC also provides resources and services for those touched by breast cancer through their Outreach Program.